Are you all set for Scribblers Festival? 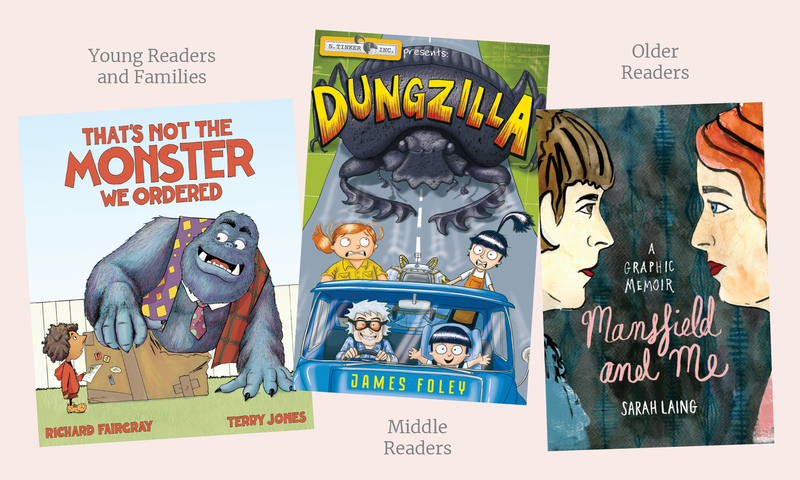 With only a week to go until the inaugural Festival, we thought we'd share some of our favourite, must-reads by our guest authors and illustrators for readers of all ages. Our youngest readers will fall in love with the illustrations of Kelly Canby’s The Hole Story, a gorgeous exploration of the magic to be found in the everyday, while Richard Fairgray’s That’s Not The Monster We Ordered will have the whole family wishing they had a monster hanging around the house. Those who love a good yarn will be enchanted by storyteller Josie Boyle’s Mrs White and The Red Desert, a wonderful tale that evokes the heat and colour of the outback, and enthralling storyteller Glenn B Swift shares his spooky perspective of Perth icon, the Bell Tower in The Ghost in the Bell Tower. Families looking to take life slower will adore Melbourne artist Tai Snaith’s reminder to stop and look at what’s around us in in Slow Down, World, a sumptuously illustrated picture book with artwork sculpted out of paper, ceramics and watercolour. And for those up for an adventure on the high seas, in The Boy Who Fell off the Mayflower, Ireland’s Children’s Literature Laureate (Laureate na nÓg), PJ Lynch draws – and for the first time, also writes – what happens to the English adventurers aboard The Mayflower, as they set sail for America, and what happens when they arrive. Australian treasure Leigh Hobbs will have middle readers laughing out loud in Freaks on the Loose, a hilarious romp with One-eyed Eileen and her gang of freaks as they terrorise class 4F and their long-suffering teacher. Meanwhile, poor Ms Stitch, teacher and witch, is finding out just how much magic, mischief and mayhem can exist in one primary school classroom in Nicki Greenberg’s wonderful Zelda Stitch. Readers with a taste for robots and adventure will be drawn to James Foley’s Dungzilla, an edge-of-your-seat race against time with the world’s foremost inventor under the age of 12, Sally Tinker, while A.F. Harrold’s Greta Zargo and the Death Robots from Outer Space will have readers laughing out loud. Chris Riddell’s Goth Girl series is perfect for anyone who loves books about books, literary puns and quirky characters. The parents will enjoy the story as much as the kids and Chris’ incredible illustrations will impress everyone. Word lovers will appreciate the uniqueness of Drawn Onward by Meg McKinlay and Andrew Frazer. Written as a palindrome, it explores our perspective on life and how attitude can turn around even the darkest of thoughts. For budding scientists and Nobel Prize-winning wannabes, don your lab coat and start your scientific adventure in Barry Marshall’s How To Win a Nobel Prize. Readers will go on a journey with Mary – who is on a mission to win a Nobel Prize – around the world, through time, and space, meeting famous scientists along the way. The book includes experiments to do at home or school. And he’s not completely making it up. Barry Marshall actually won the 2005 Nobel Prize for Medicine, with Robin Warren, for discovering that stomach ulcers can be caused by bacteria and can be treated with antibiotics. He experimented on himself to prove their theory! Word-nerds unite in David Astle’s Gargantuan Book of Words. Packed with puzzles, quizzes and fun facts – and heaps of funny drawings and appealing activities – it’s the perfect activity book for kids who likes puzzles, kids who like language, or kids who just need something to do that doesn't involve a screen! A wordplay puzzle book from the wordplay master! Calling all ecologists and fossil hunters! Aviva Reed’s EON. The Story of the Fossils is a ground-breaking art/science book that combines exquisite illustrations with scientific prose to explore the theory of evolution. EON tells the story of every living thing on the planet. It asks “What we can learn from billions of years of being part of an evolving ecosystem?" A culmination of decades of research, art-making and study, EON is edited by prominent palaeontologist and ethicist, Professor John Buckeridge (RMIT). In The Song From Somewhere Else, English poet and performer A.F. Harrold teams up with illustrator Levi Pinfold to create a poignant, darkly comic and deeply moving story about the power of the extraordinary, and finding friendship where you least expect it. Perfect for fans of Roald Dahl and Neil Gaiman, it’ll make you think twice about first impressions. Campbell Whyte explores what home means in his brilliantly realised illustrated novel Home Time, combining his love of video games, comics and art history into one big adventure. It was recently nominated in the 2018 Eisner Awards for 'best publication for kids'. In Sarah Laing’s graphic memoir, Mansfield and Me, she shares her journey to become a published author, parallelled against the life of her literary hero, Katherine Mansfield – without the drama! Set in London, Paris, New York and New Zealand, part-memoir, part-biography and part-fantasy, it examines how our lives connect to those of our personal heroes. For readers who enjoy character-driven narratives, AJ Betts’ multi-award-winning, best-selling novel, Zac & Mia, explores how different people deal with adversity – and each other. It’s the story of two teenagers, Zac and Mia, brought together by the same challenge – facing cancer – and, in the process, how they form an unlikely and unexpected friendship. The book was adapted for American television for which it recently won two Emmys. For kids with an interest in the socio-political, Jesse Andrews’ MunMun is a pointed, amusing and highly original story set in an alternate reality wherein every person's physical size is directly proportional to their wealth. From the rat-sized poor to the Trump-Tower billionaires, Jesse’s writing addresses themes of inequality, status, greed and human nature. Happy reading! See you at the Festival!